It's been my dream to do a warm weather getaway during the middle of winter for awhile and we finally made it happen this year! I've mentioned Miami a few times on the blog over the years. It's somewhere we've been before but wanted to explore more because it has a lot to offer in terms of culture and food and located in South Florida, it happens to be a short flight from NYC (2.5 hours). We've already been to South Beach and the objective of this trip wasn't the beach. So we chose to stay in downtown Miami this time and discovered it's quite a happening area. East Miami appealed to us because of it's prime downtown location as well as it's modern, high tech and luxurious design. The hotel features fabulous amenities like an impressive outdoor pool deck with a lap pool, spa pool, cold plunge pool and a hot tub as well as a 24-hour fitness center. It also happens to be situated within the Brickell City Centre which is very convenient for shopping, dining and entertainment. 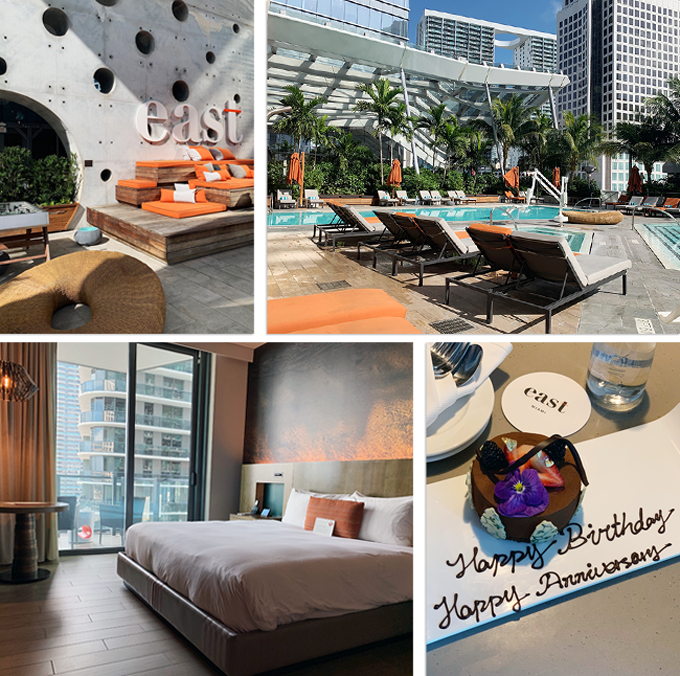 We stayed in an Urban King room East boasts the largest average room size among hotels in Miami and all the room have floor-to-ceiling windows and a balcony. The toiletries are Malin & Goetz. We stayed in an Urban King room and it was spacious and clean. The sleek decor felt fresh and there was no tacky bedspread or extraneous decor pillows that we needed to remove from the bed which was firm yet comfortable. The control panel on the night stand that could control all the lights was really useful and something all hotel rooms should have. The walk-in glass rain shower had a spa-like feel and the water pressure was actually really good. The balcony was really nice and we would've tried to have breakfast there had we stayed longer but we did enjoy sitting out there in the mornings and evenings. Even though we were in the heart of downtown, there were no issues with noise. The complimentary Wi-Fi was strong throughout the property. The hotel itself was very modern and there were stylish yet subtle Asian-inspired touches in the decor throughout. We found the staff to be very friendly and helpful. They knew we were celebrating a birthday and anniversary and surprised us with a chocolate mousse dessert on our first night which was lovely. We enjoyed hanging out by the pool even though we didn't venture in. All in all we really enjoyed our stay there. If you're not in Miami to go the beach, I'd totally recommend this hotel. The Miami Dade transit system includes Metrobus, Metrorail elevated light rail, and Metromover trams. The Metrorail was a 25 minute ride into the city from from Miami International Airport and cost $2.25/ride. We also took it to the Vizcaya. We also took advantage of the Metromover which is a free tram service that operates in the downtown and Brickell area. It was a fairly scenic ride overlooking the city and there was a stop conveniently located within the Brickell City Center. Their public transportation seemed to be clean and fairly efficient if not extremely fast. For other less easily public transit accessible locales, we used Lyft. Lyft just happened to be running a 50% off promo the week we were there so we never paid over $8.00 for a ride anywhere. Taxis and ride share options seem to be quite popular there in general. With over 100 restaurants, bars, and cafes lining the streets, there are no shortage of dining options in Miami. We did actually pre-game a little on where we wanted to dine before we even got there and those choices turned out to be pretty solid. I'm not sure if this is standard practice in Miami, but most of the nicer, dine in restaurants we ate at automatically added in an 18% service charge to the bill. We knew wanted to eat at KYU after seeing the name pop up on several lists of the best restaurants in Miami. It also happens to be conveniently located around the corner from the Wynwood Walls. The cuisine which fuses traditional and Asian-inspired flavors centers on dishes cooked in their wood-fired grill. We were happy to see that they had a selection of beverages for non-drinkers and tried a black cherry soda pop and thai tonic made with kaffir Lime, lemongrass & elderflower. Their food is made for sharing so we ordered six dishes. 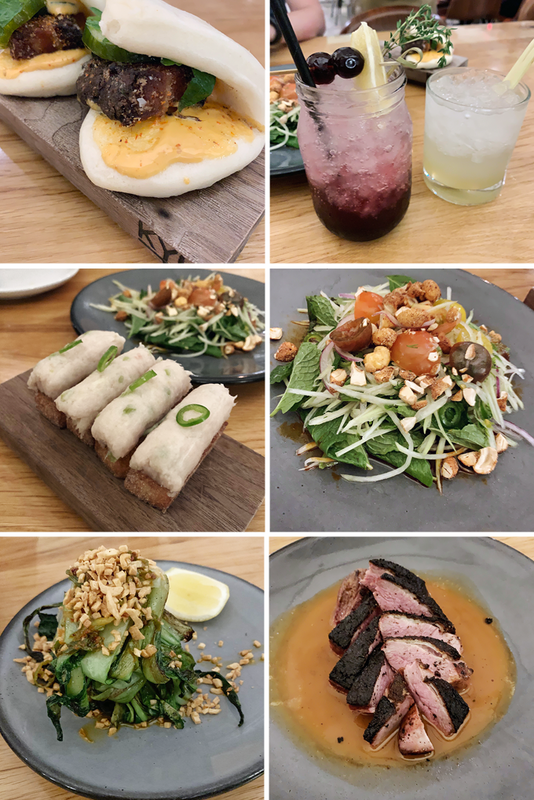 The standouts were the pork belly buns, the crispy spicy hamachi tartare ( a variation on my favorite spicy tuna on crispy rice) and the smoked duck breast which all just had an outstanding depth of favor and were perfectly prepared. If memory serves, our server said that the duck was cooked for 4 hours. It was the best duck we've ever, tender, juicy with an amazing smoky taste. The green papaya salad was just a tad too sour and the grilled baby bok choy was good but nothing special. The eclectic yet chill vibe was cool and the service was friendly and knowledgeable. It's no wonder this place was absolutely packed on a Wednesday night. They did not impose the 18% service charge on our bill and we tipped 20%. This landmark Cuban restaurant is a must for a sample of the best Cuban cuisine Miami has to offer. The ornately decorated with crystal chandeliers, etched glass and statuette, the spacious restaurant with a lively atmosphere pays tribute to it's namesake Château de Versailles in France and it's menu features a comprehensive range of classic Cuban cuisine. 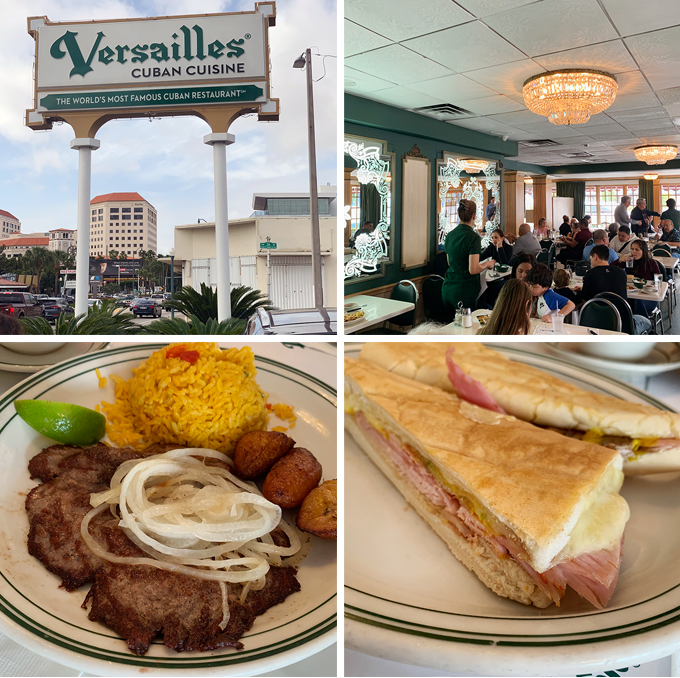 We tried their famous Cubano (Cuban sandwich) and the palomilla steak which was served with sweet plantains, yellow rice and black beans and now understand why this restaurant is a local institution. The food was delicious and the service was outstanding. With a 22% tip added, our meal was just $30. We arrived a little after 11AM to avoid the crowds, not realizing that lunch service didn't begin until 11:30AM. We were all ready to leave and our waiter Mijael took our drink orders and just told us to sit and chill as it happens quite often. We didn't try their famous coffee since neither one of us drinks coffee. There's also a detached bakery that offers an assortment of savory and sweet pastries and bread. 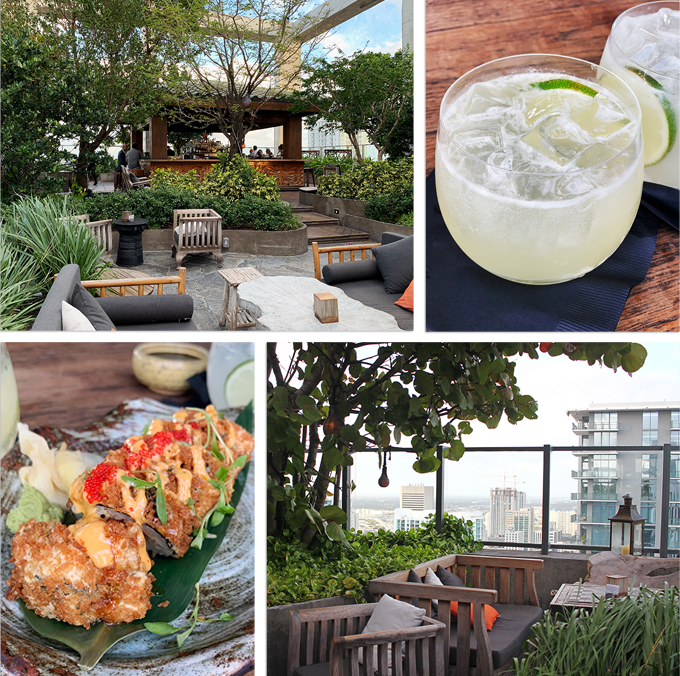 Located on the 40th floor of the EAST Miami hotel, Sugar attracts locals and tourists alike with it's garden type setting and panoramic views of the downtown Miami skyline. Sugar serves signature cocktails along with an array of tapas style bar bites, all with an Asian inspired twist. We sat at the bar after being told that there was a $75 minimum spend per person at a table. Since it was a special occasion, I had a Dahlia which had avion silver tequila, edlerflower, thai chili, cucumber and lemon. Our bartender made it without the thai chili after I expressed concerns it might make the drink too spicy. My husband had the East of Miami made with plymouth gin, green tea, ginger and lime. Both drinks were refreshing without being overly strong or sweet. Since we were hungry, we also had a salmon crunchy roll which was tasty and hit the spot. Our original pan was to stay and watch the sunset but the cold and windy weather made us think better of it. The cold actually wasn't so bad but it was the wind that was a little crazy. You'd never be able to tell from my photos. We were glad we got to check it out and can understand why it's a local hotspot. This bar is as pricey as it is picturesque. Our bill was $62 with the 18% service charge. Knowing that it was conveniently located in our hotel, we knew one of our meals would be at Quinto La Huella since Uruguayan cuisine is something we've never had before. You can choose to dine inside their rustic style dining room or stylish outdoor patio surrounded by lush greenery. We got an order of empanadas with beef, olives, boiled egg and salsa criola, a Caesar salad and and a lomito sandwich to share. Everything was tasty but the lomito sandwich which had eye of round cutlet, ham, bacon, cheese, lettuce, tomato, egg was the real standout in terms of flavor. It was messy to eat but totally worth it. 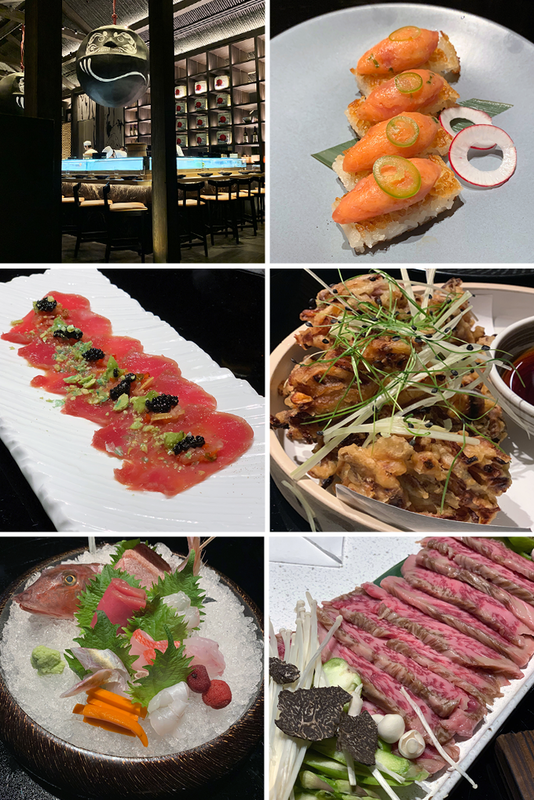 We had a celebration dinner at Katsuya which just happened to be conveniently located within the SLS Hotel across the street from our accommodations. The sleek Phillippe Starck designed space is a backdrop for a menu of innovative sushi and robata dishes. We got the special tuna tartare, crispy rice with spicy tuna (Chef Katsuya's most famous dish and one of my personal faves), the sashimi omakase, seasonal vegetable tempura and the special wagyu beef cooked on a hot stone. The service was excellent and our waiter's suggestions were on point. Considering it's a signature dish, the crispy rice with spicy tuna was a little disappointing because the rice was just too hard and sticky. Everything else was good though especially the wagyu beef which just melted in our mouths. 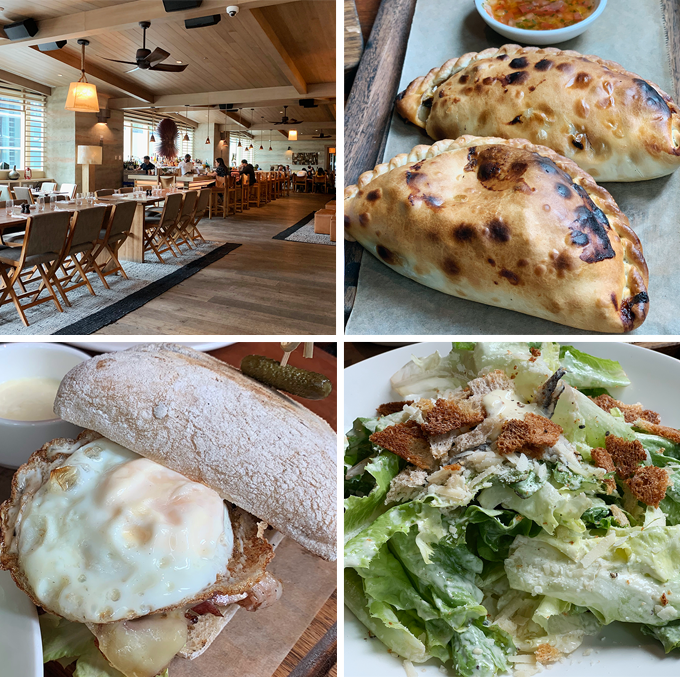 American Harvest is a fast casual eatery inside Brickell City Center that offers a range of fresh and healthy fare using clean and responsibly sourced ingredients. We got an American Harvest Burger, a Harvest Cobb Salad with seared tuna and Mashed Avocado & Chips. The burger made with made with an angus, chuck short rib, brisket blend with fontina cheese, house mayo and caramelized onion was delicious and so juicy. The salad which had mixed greens, a bacon & pumpkin seed crumble, black beans, queso fresco, diced avocado, baby heirloom tomatoes with chimichurri vinaigrette was super fresh and so tasty. If we had one of these in NYC, we'd dine there all the time. Miami may well be known for sun, sand, design and nightlife and it's quite a mecca for art, architecture and culture as well. 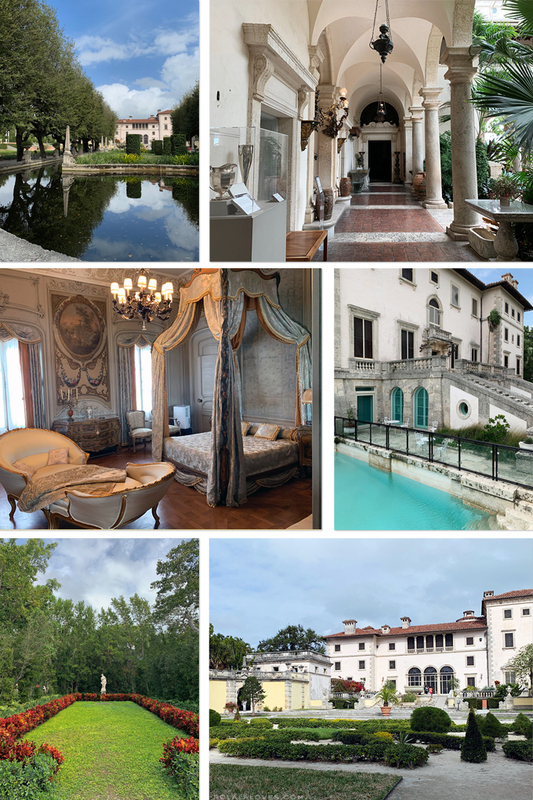 A national landmark, the Vizcaya is a living museum that's modeled after a centuries-old Italian villa. 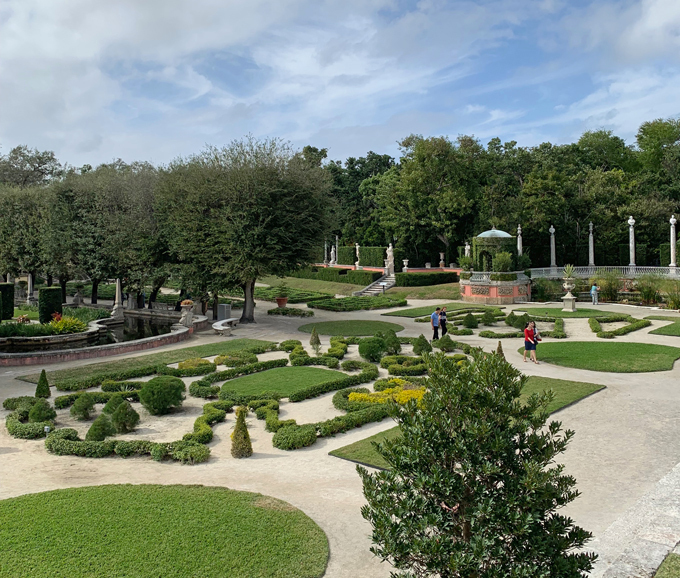 Industrialist James Deering decided to bring a taste of Europe to Biscayne Bay in the 1910's when he commissioned the construction of Vizcaya Museum and Gardens. The home’s 34 beautifully decorated room includes over 2,500 antique art objects and furnishings while the sprawling, surrounding estate includes10 acres of landscaped gardens, including 2,000 orchids; and 25 acres of endangered forest lands. We spent a very lovely afternoon here just wandering about. Some areas of the grounds definitely had a very Resident Evil feel and there were a number of photo shoots going on all around. This was easily my favorite spot that we visited on this trip. If we had more time, I would've loved to have visited the Fairchild Tropical Botanic Garden as well. 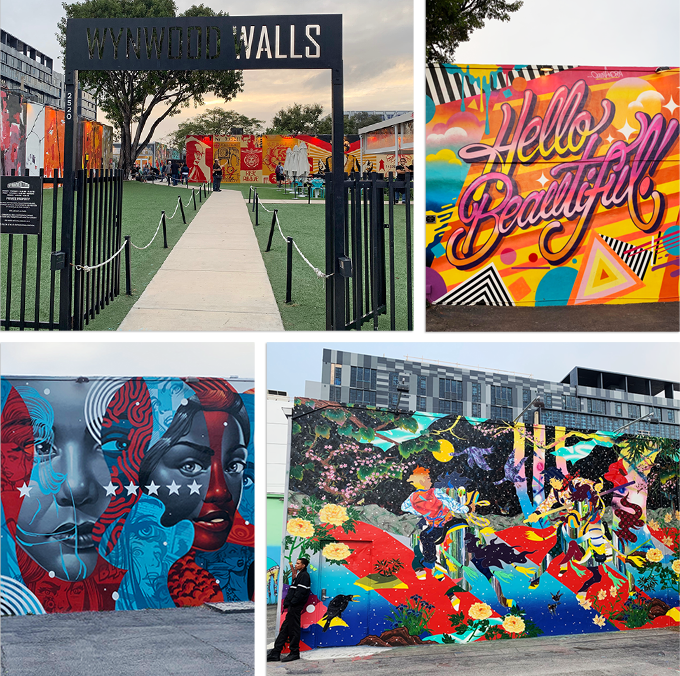 This outdoor "gallery" may just be Miami's most Instagrammed spot but that doesn't make it any less cool. Featuring an array of artwork by graffiti artists and muralists, the gallery is pretty quick to breeze through and there are a few seating areas along the way where you can rest and take it all in. One of the most striking murals was the full wall created by Shepard Fairey aka the artist who designed Obama's "Hope" poster. We saw these two ridiculously dressed Asian women (fur coats with flip flops) who wheeled in a stroller with an infant who they decided to just abandon for more than a few minutes as they proceeded to take a million photos of themselves posing and preening. Anyone could've walked off with the kid and they wouldn't have known. What trash! This is a sick time we live in. 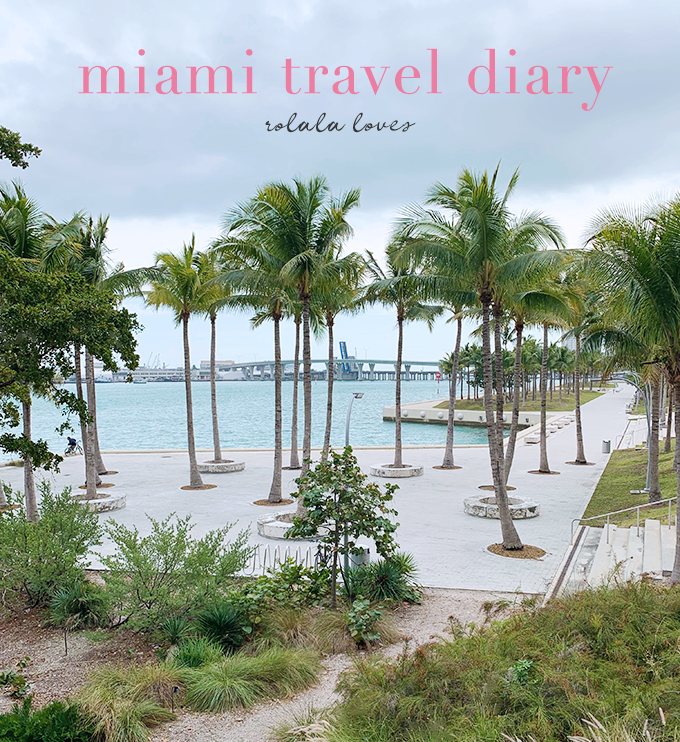 I grouped these two together since they are neighbors by the Biscayne Bayfront making it easy to visit them both in one trip which is exactly what we did. 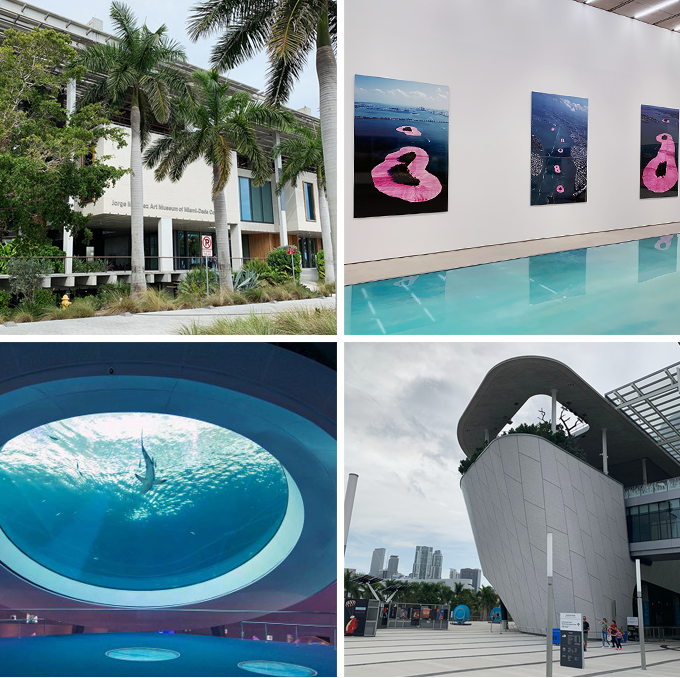 The Pérez Art Museum Miami (PAAM) is one of the city’s most popular modern art museums as well as a major player on the Miami art scene. The impressive 200,000-square structure designed by Herzog & de Meuron houses an eclectic collection of art including an outdoor sculpture garden. A notable exhibition going during our visit was Christo and Jeanne-Claude: Surrounded Islands, Biscayne Bay, Greater Miami, Florida, 1980-83, a retrospective documentary of the project, artists Christo and Jeanne-Claude undertook when they surrounded a seven-mile-long string of 11 Biscayne Bay islands in pink. The Frost Museum of Science is an institution dedicated to science made up of four separate buildings including a planetarium and aquarium. The well put together exhibits are engaging and will appeal to adults and children alike. The highlight for us was the incredible aquarium spanning three levels and featruing a wide variety of marine life including sharks. Also known as Maurice A. Ferré Park, Museum Park is a 30-acre public, urban park overlooking the Biscayne Bayfront in downtown Miami. 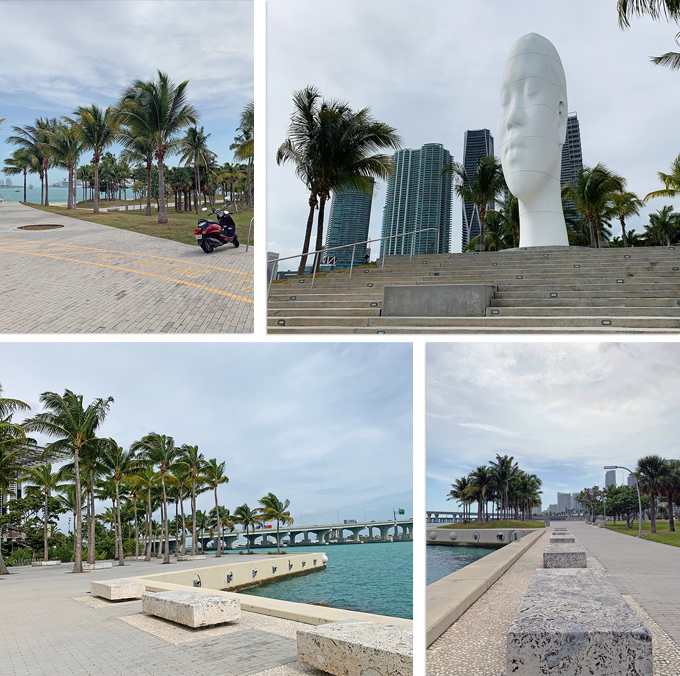 The scenic park which is bordered on the south by the American Airlines Arena and Bayside Marketplace, and by the Perez Art Museum Miami and the Patricia and Phillip Frost Museum of Science on the north features a waterfront baywalk and promenade from Biscayne Boulevard to Biscayne Bay. 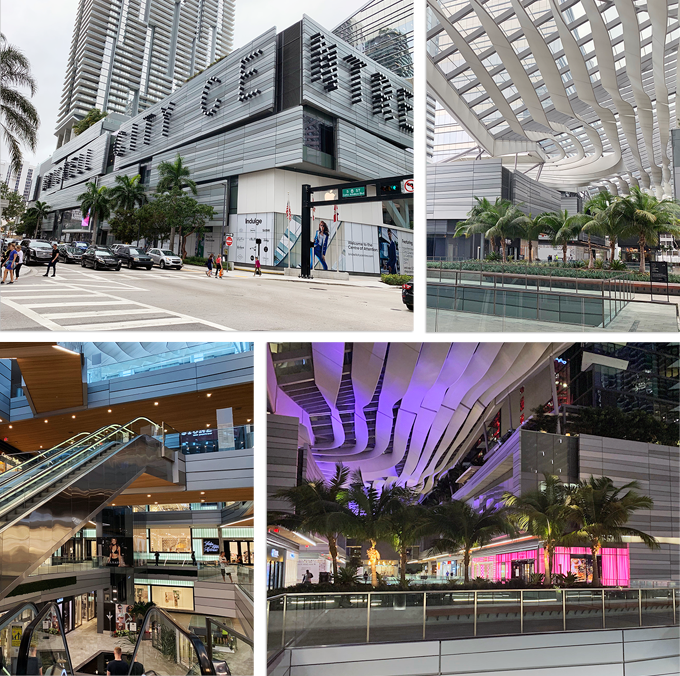 Brickell City Centre is an open air mall that mixes striking architectural details with indoor and outdoor elements in it's modern structure of three interconnected buildings. It features a number of upscale retail shops as well as a variety of dining options along with a movie theatre. 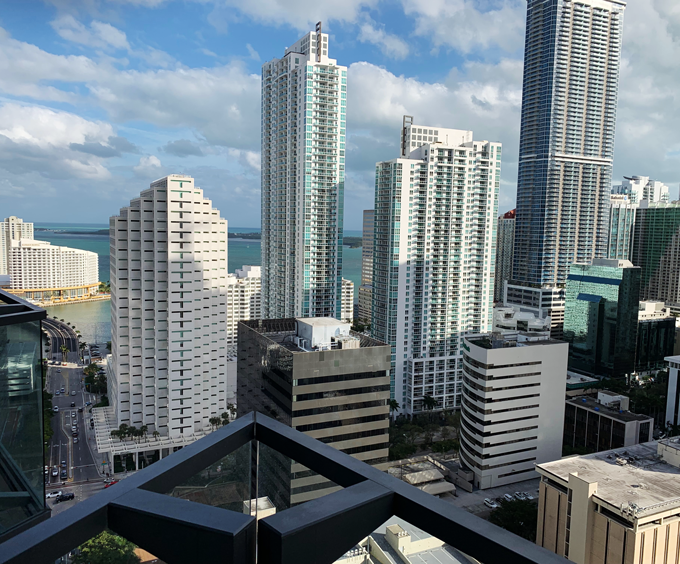 Our hotels's location in the Brickell City Centre was actually very convenient since it meant we were always close to food and transportation. On one night when it rained we didn't even have to worry about it since we knew we would be having dinner in the mall. It looks well maintained and has a really nice ambiance. We walked around but didn't shop. There are many popular stores like Saks Fifth Avenue, Zara, Reiss, Sephora, and Diptyque among others. 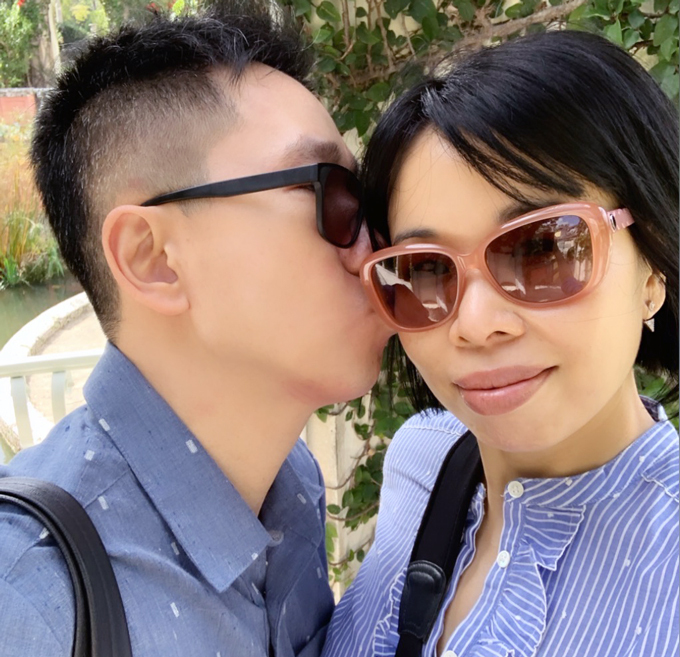 This little jaunt to Miami couldn't have been a better way to chase away the winter blahs as well as a special way to celebrate a birthday and an anniversary. We'd been having a relatively mild winter in New York and then the weather became downright frigid the week we escaped. The temperatures hovered between the 60's to high 70's in Miami which wasn't exactly hot but balmy and pleasant. We were okay with that since we weren't there for the beach. And though there was a threat of precipitation a few times, the only time it did rain was one evening when we were already back at our hotel. We were there for 3 nights and 3 days which was about right. We could've easily done another day since we took things at a really leisurely pace. We're actually already talking about taking another trip there next winter. Have you been to Miami? How did you like it? I have never been to Miami, but I could do with some warm weather break right now too! All the food sounds wonderful! I love Cuban food and ate at Versailles maybe 15 years ago (still good then!). Kyu and Quinto la Huella sound especially good. I'll definitely have to visit again some time! That sounds like a really nice hotel! Aww I love that last photo of you guys! I've only been to Miami once in college so it was all about beaches and clubs then. Also I don't think we did enough research on where to eat because our meals definitely were not as enjoyable as yours! Bookmarking this post for my next Miami trip, I definitely want to go back! You really took advantage of those three days, you managed not only to check out quite a few many restaurants and bars, but also to try a new and different cuisine. I never tried Uruguay cuisine, I'd love to give it a try. I think I actually heard about Miami having a variety of cuisines available, something similar to LA, if I remember well. I'm sure it's a nice town to visit. A break from the cold must be more than welcomed. It seems you had a delightful time there, I'm happy to hear you had such a nice birthday and anniversary celebration.That's lovely. The hotel you stayed at looks wonderful. I'm not surprised to hear you're planning to visit this city again. That last photo of you two is adorable. Miami is the place to party so many amazing delicious restaurant. You took outstanding images and thanks for the detail information now when I go visit need to try that Cuban place. Glad you guys got warm and celebrating your Anniversary and birthday Happy Anniversary and Birthday!!! Now I need to archive this for when I go. Oh all that food looks so good. Looks like you guys had such a wonderful time. Oh my so jelly!! Wish I could get away to Florida. Very cool the have public transit. I wish Tampa did too. Would love to get to Miami I usually go to Tampa as I have a friend there. Beautiful sunny pics! And very useful post. Merci! Dear Rowena, it must be really wunderful to be during winter in warm Miami and the flight duration is really bearable. The hotel you have chosen looks modern and cool, what I really like. And after watching and reading about all the yummy food you had now my month is watering. But wow, this bar is really not cheap as you had to pay 62 $ for the food you had. Thanks for sharing all the wonderful pictures. Florida is often our warm winter getaway of choice too; but we have never been to Miami. Looks like a fun city with lots to see and do. Sounds amazing!!! I need a warm weather getaway too! Ha! Over here I've always dreamed of escaping the summer for somewhere winter. Especially during Christmas since y'all get to enjoy a white one while we sweat it out in Australia. We're totally the opposites. It's amazing sometimes to hear this for me. Over here escaping winter for summer is the norm, I'd spent my whole childhood like that as my parents would return back to their motherland to visit family during the months of July and August. Two years ago I got to finally make a dream come true and leave for the USA during January. Escaping unforgiving heat for LA "winter" was not welcome hahaha! It was virtually the same temps as back home. Thankfully moving more inland to the Grand Canyon and we got to experience snow. That was epic and something I'll never forget. Miami hasn't always been on my radar, mainly because it is just sand and nightlife. I knew about the architecture, having such a large latin community I always expected grandeur anyway, but I had no clue about the art. I am very much intrigued now and definitely wouldn't mind visiting this city. Thanks for opening my eyes Rowena and I'm glad you both had a lovely time. Hopefully you'll get to return soon.